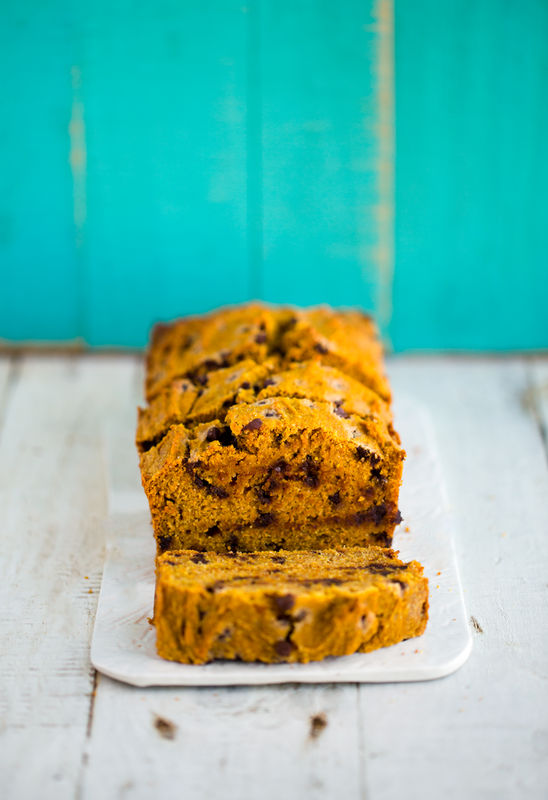 This Chocolate Chip Pumpkin Loaf is fluffy, festive golden orange in color and studded with melty chocolate chips. 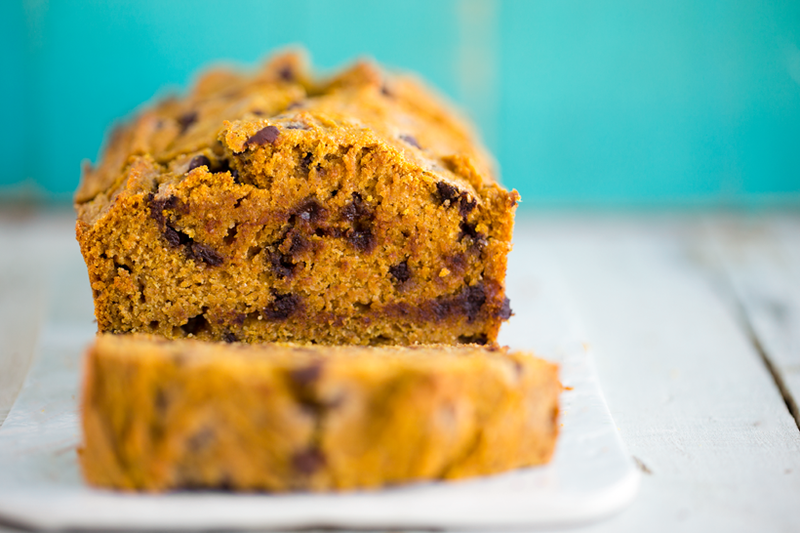 This pumpkin bread is vegan and sweetened with maple (or agave) syrup and apple sauce. The chocolate chips also add their own sweetness. 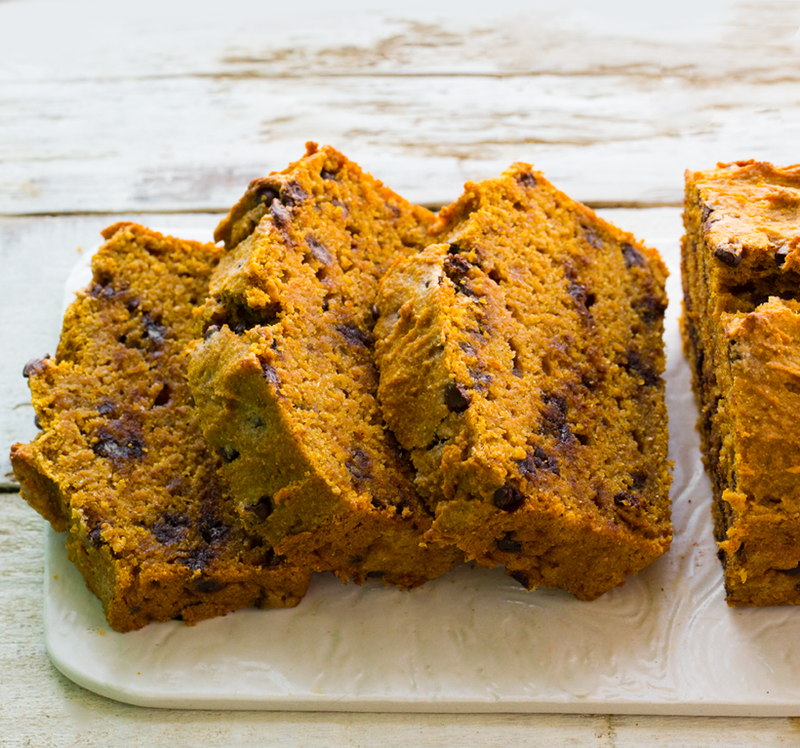 This pumpkin loaf is perfect for a fall snack or served at breakfast, or any time of day, with tea or a latte or cocoa. It also makes a satisfying sweet treat due to all the chocolate goodness tumbling through each thick and perfectly-spongy slice. 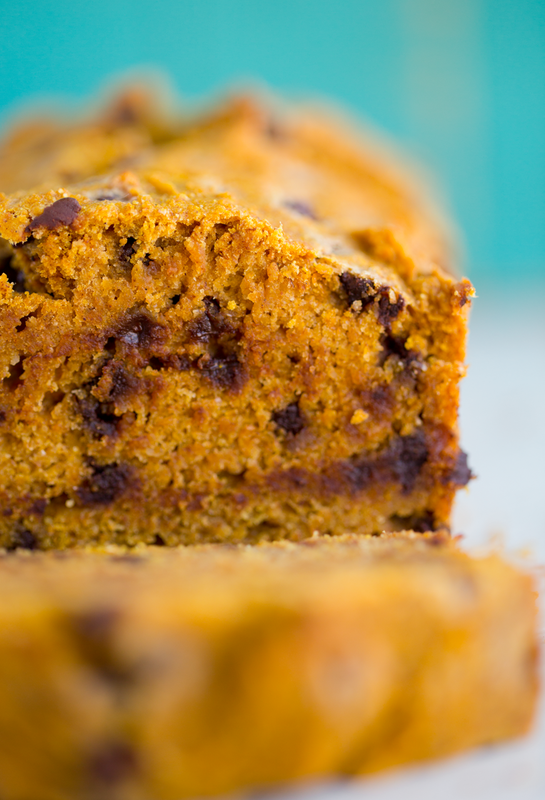 Current mood = fall baking. This loaf. Yes, please. With chocolate chips on top. Get the recipe and a how-to video!.. 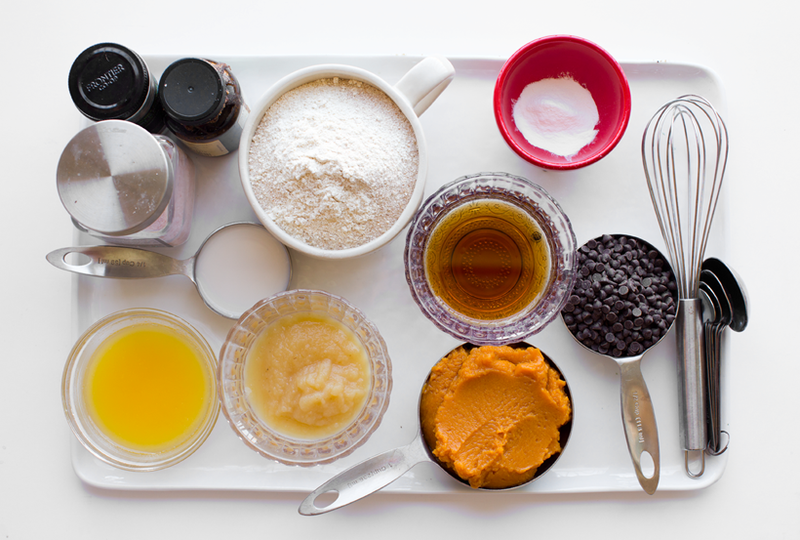 Gather the pretty simple ingredients. I will bet you have most of these on hand already! Hiding behind curtain #1 .... the loaf of your dreams! Melty chips. I used mini chips but any size will work. For some reason, I always instinctively shy away from pairing pumpkin and chocolate. Maybe that is because pumpkin is technically a veggie and veggies and chocolate don't exactly make me crazy with excitement. 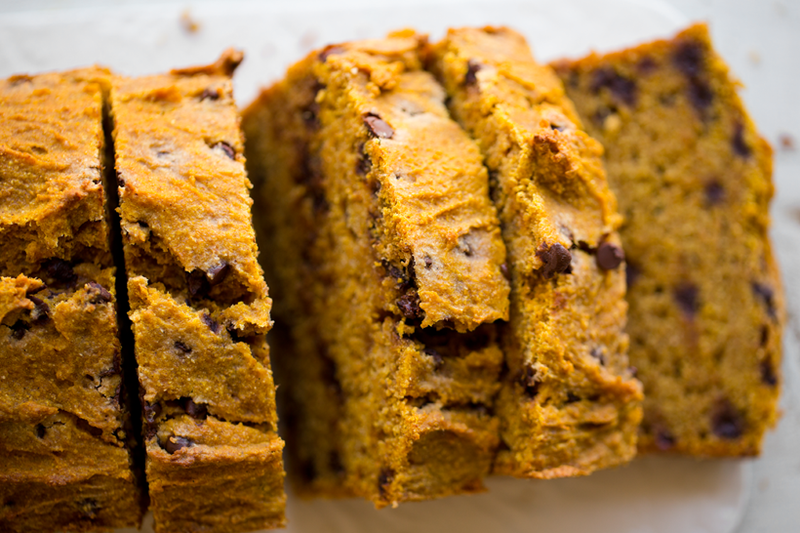 But then I try and remember how much I actually love pumpkin + chocolate chip baked goods like muffins and cookies every time I have them -- and pumpkin brownies are crazy good too. 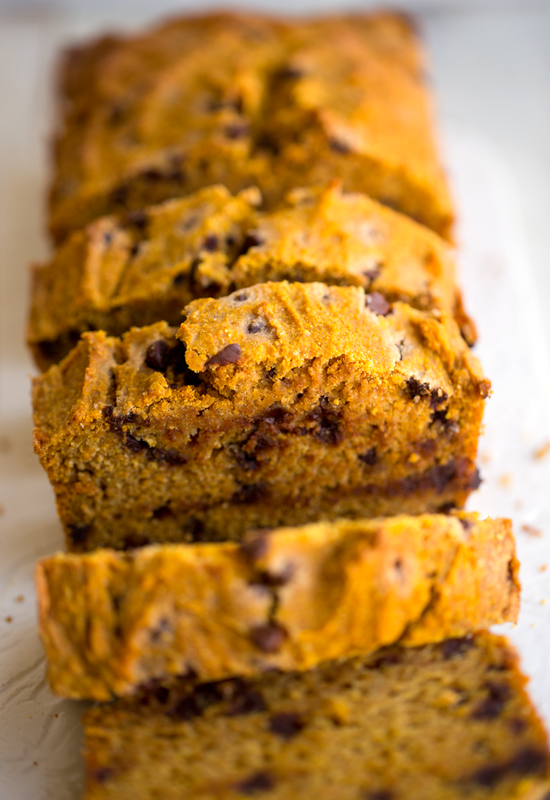 And so in went the chocolate chips in the pumpkin loaf recipe. 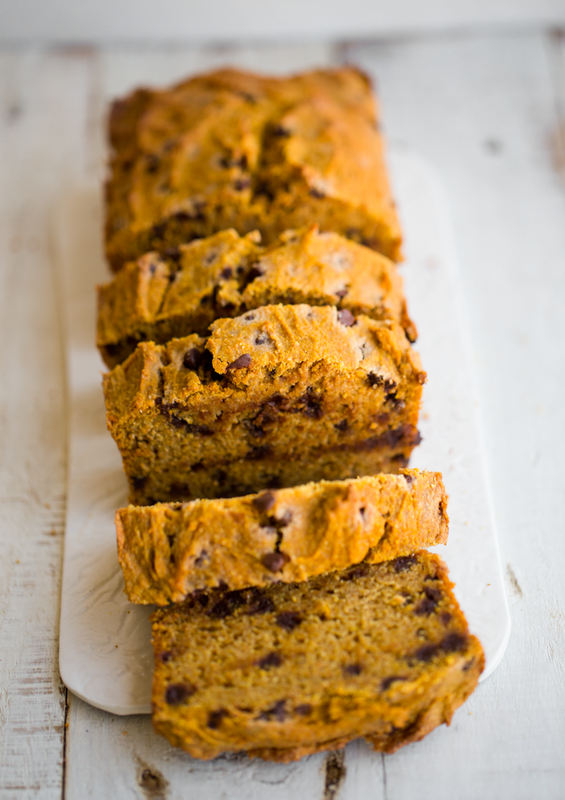 The interesting part is that I also always think that adding chocolate chips is going to ruin the loaf. Maybe they will smother the pumpkin flavor or the delicate pumpkin pie spices and vanilla. But they totally do not! 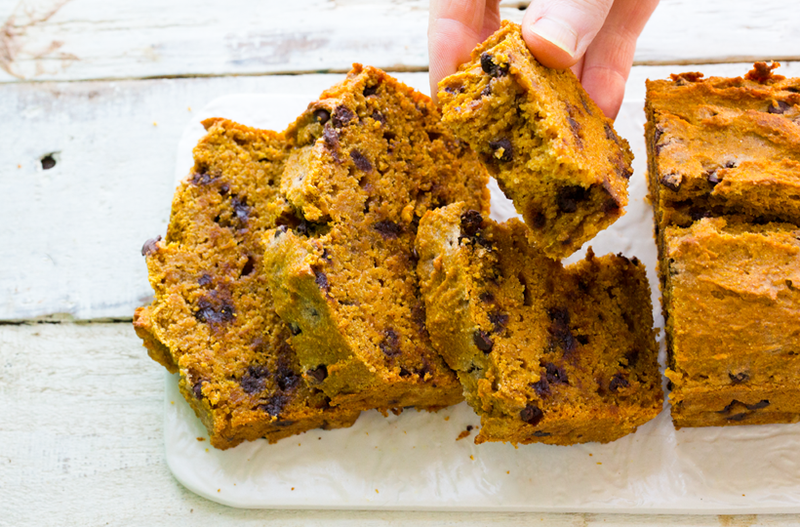 The chocolate actually adds this earthy, almost smoky flavor and gooey, melty texture that mingles with the hearty pumpkin and bright, cozy spices very nicely. So hooray! Ha. 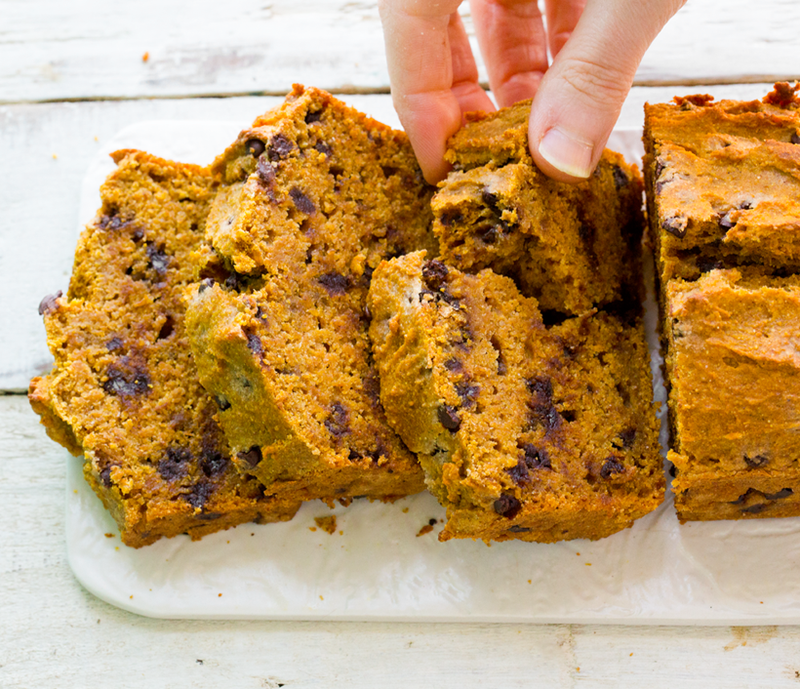 The chocolate chips in this recipe DO NOT ruin the loaf. 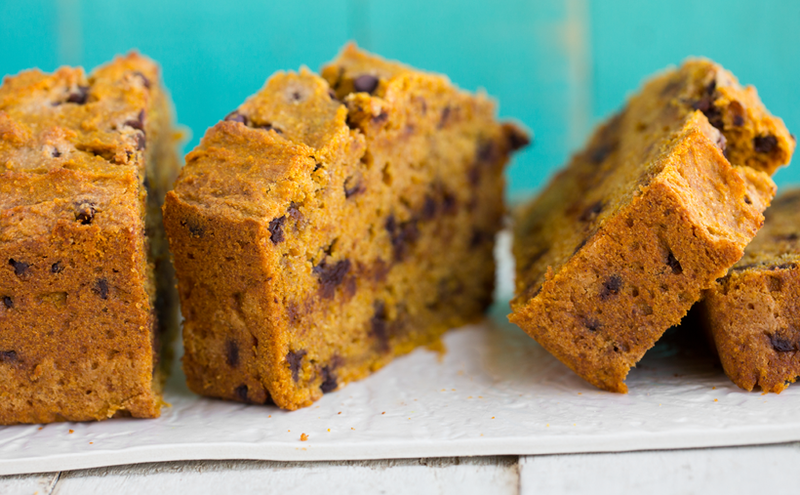 This pumpkin recipe is very happy to be a chocolate pumpkin creation. Because, I mean really, who doesn't get excited about chocolate?? ...Ok, ok, sometimes me. 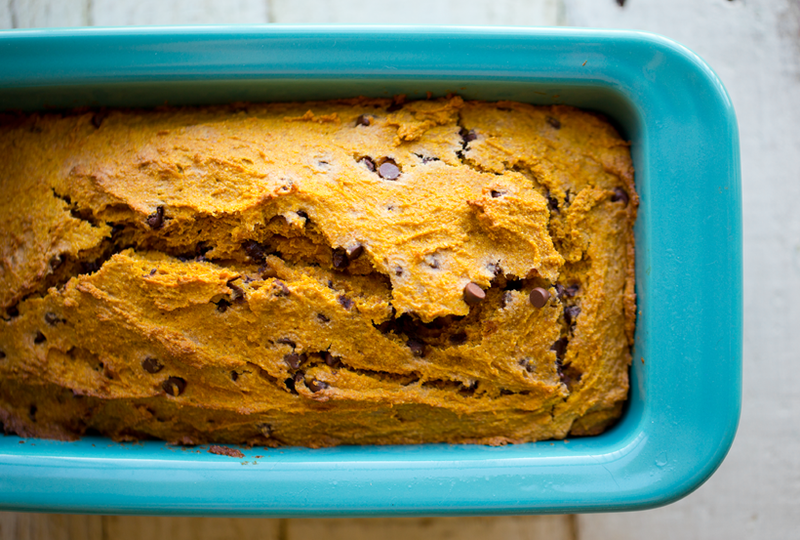 Once in a while I actually don't want the chocolate and just straight up crave pumpkin loaf. Well if that is your mood today, you can absolutely omit the chocolate. If desired, try folding in some diced apple or maybe some chopped walnuts or pecans. Yum. Actually chopped pecans would be amazing in this recipe. 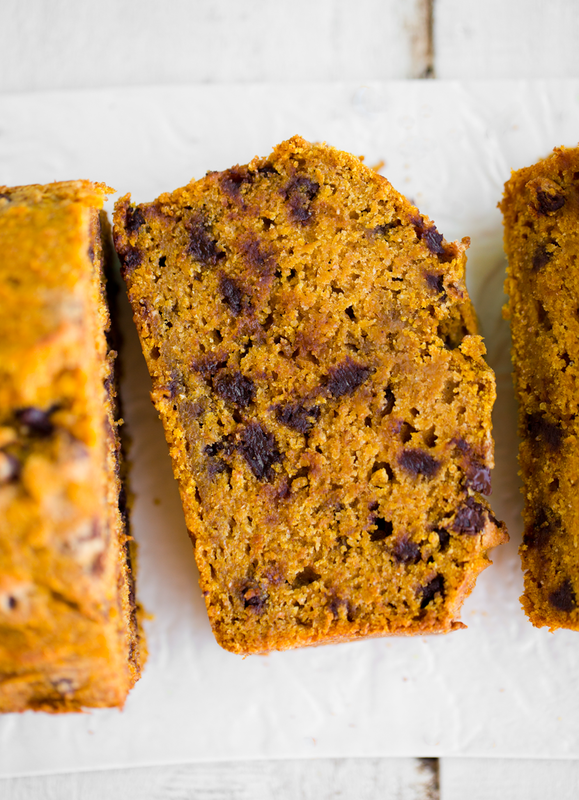 This pumpkin loaf is vegan, from the vegan buttery spread to the applesauce egg replacer and the vegan allergy-friendly mini chocolate chips. I am really excited about the video for this recipe too. Hope you can check it out! 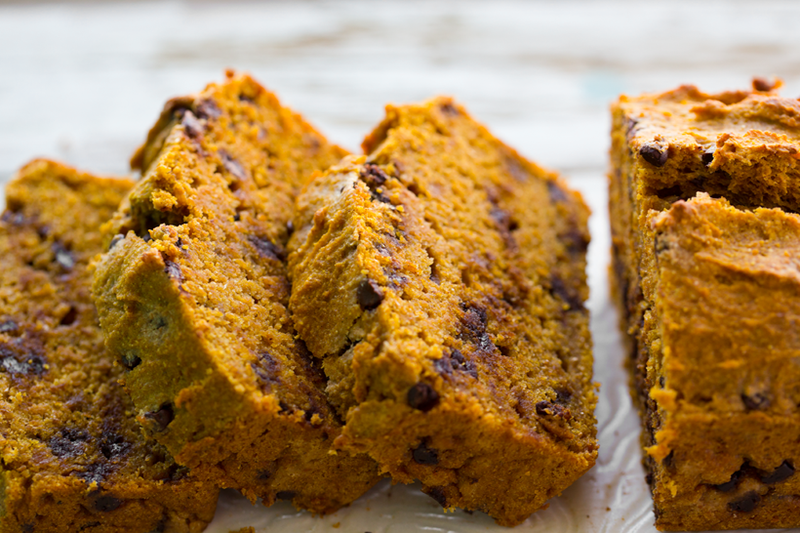 This moist and fluffy vegan pumpkin loaf is studded with chocolate chips. 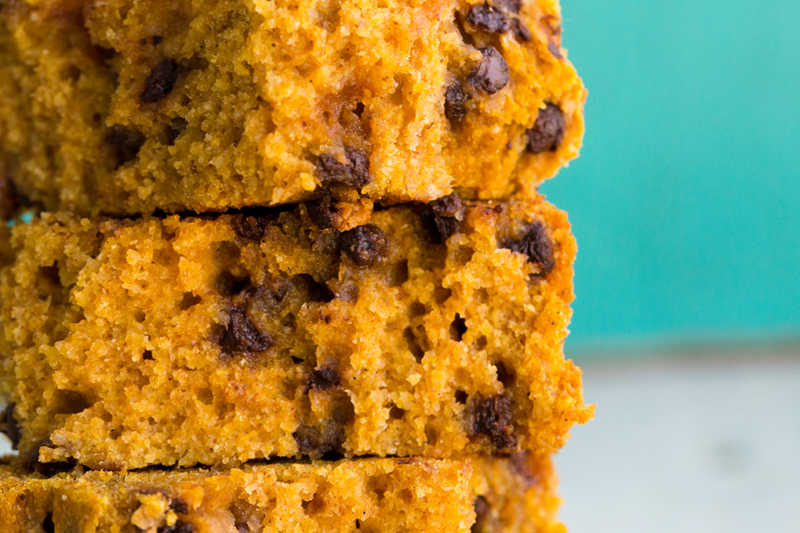 Loads of pumpkin spice flavor in every bite. Pre-heat oven to 400 degrees. Grease loaf pan with coconut oil or vegan butter. Add all the wet ingredients to a large mixing bowl and hand whisk or beat until smooth and fluffy. Add all the dry ingredients and whisk or beat in until a fluffy and thick batter forms. Spoon the batter into the loaf pan. Smooth top. 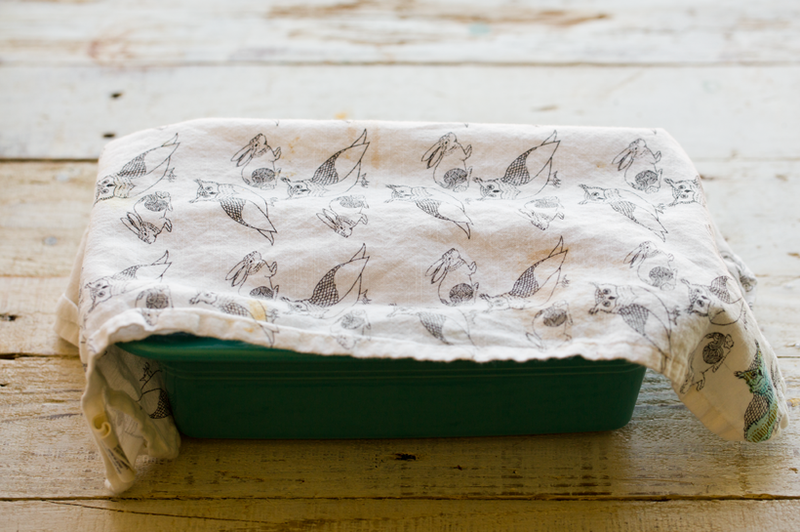 Allow to cool for an hour before slicing and serving.